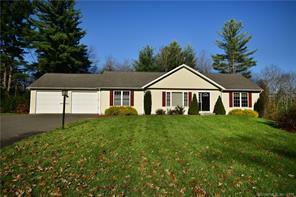 In walking distance to Crystal Lake on a private cul-de sac road, enjoy this adorable ranch home! 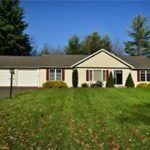 In walking distance to Crystal Lake on a private cul-de sac road, enjoy this adorable ranch home! Located on a beautiful 2.63 acre homesite, you’ll adore the open well designed floor plan. The design maximizes space and allows for flexibility with large kitchen opening to the living room. The kitchen has many desired features including large sit up island, dinette area, two pantries, double sink w. stainless faucet and hand held, plus, recessed light on dimmers, and ample cabinet storage. Sliders lead off dinette to a private backyard deck lined with mature trees. Home has ample sunlight from large windows throughout the home! Living room boasts pellet stove w/ decorative wood beam mantle making winter days cozy and warm. A perfect spot to curl up and relax. The master bdrm boasts a large walk-in closet and attached master bath with a walk-in shower and separate tub! The living areas separate the master bedroom from the two other bedrooms, which share a full-sized bath, and have large double closets. This home also features a first floor laundry w/ additional shelving, additional closet space, two car attached garage, paver front walk with beautiful landscaping, walk out full basement/ w double doors, central a/c for those hot Summer days, propane hot air heating and much more! Enjoy close proximity to Crystal lake for kayaking, paddling, swimming, fishing, or winter fun. A perfect home for all seasons.